Version française en bas de page!! We have completed the Tour of Hope 2014 tourofhope.asia, riding 850 km from Udon Thani to Chiang Mai – visiting amazing temples, and presenting the donated bikes and new library building to the schoolchildren. It was a very rich experience and we are working on a new video of that – coming soon! And now our solo adventure begins! 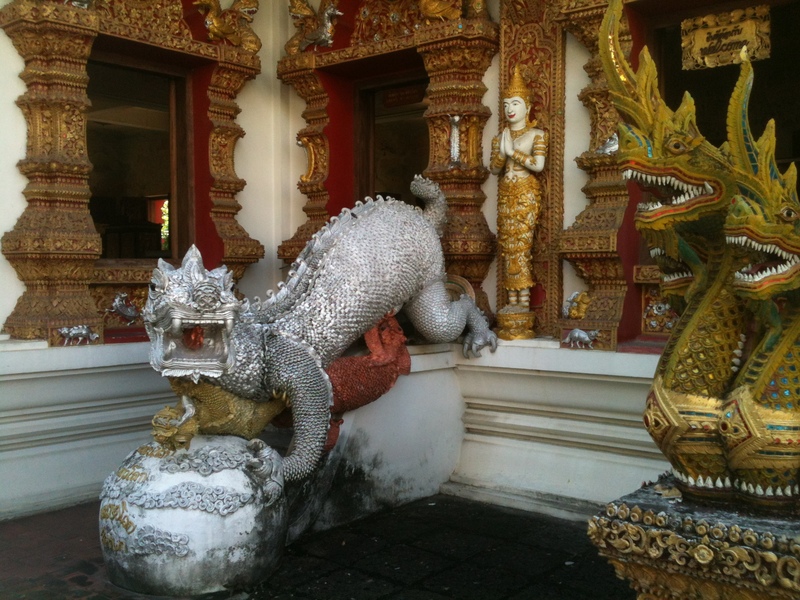 We spent 3 days in Chiang Mai: repairing both the bodies and the green monster bike, in preparation for the next stage as we cycle across Thailand to Laos. Chiang Mai seems to be the city of a thousand markets. The famous ones are huge: the night bazaar, the Saturday Market at Wua Lai, the Sunday Market starting at Tha Pae Gate and spreading throughout the old city. Markets feature food stalls, local crafts and artisans as well as standard tourist fayre. Whenever you turn your head, you find another new and fascinating market to explore. 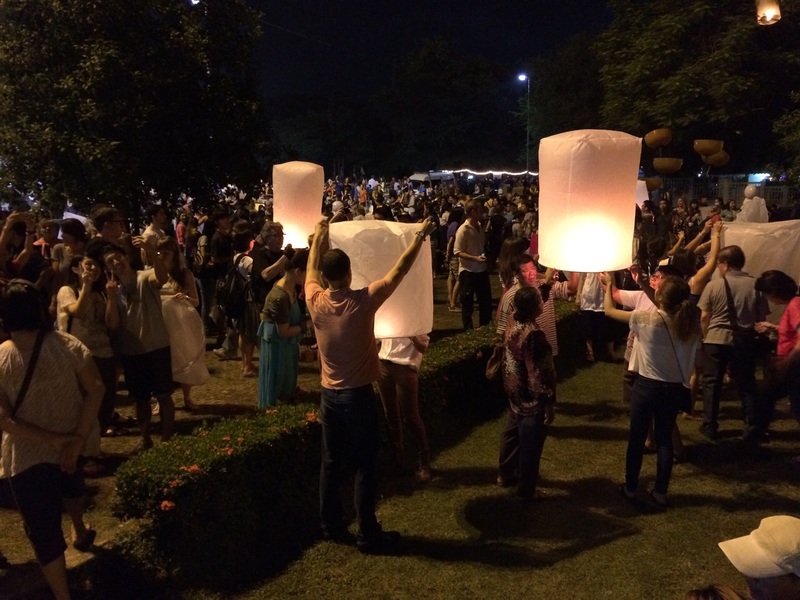 We were lucky enough to be in Chiang Mai at the time of the Loi Krathong festival – festival of the lanterns. Here people cast there bad luck onto a floating flower coral with a candle and pass it on to the Ping river to cast it away. 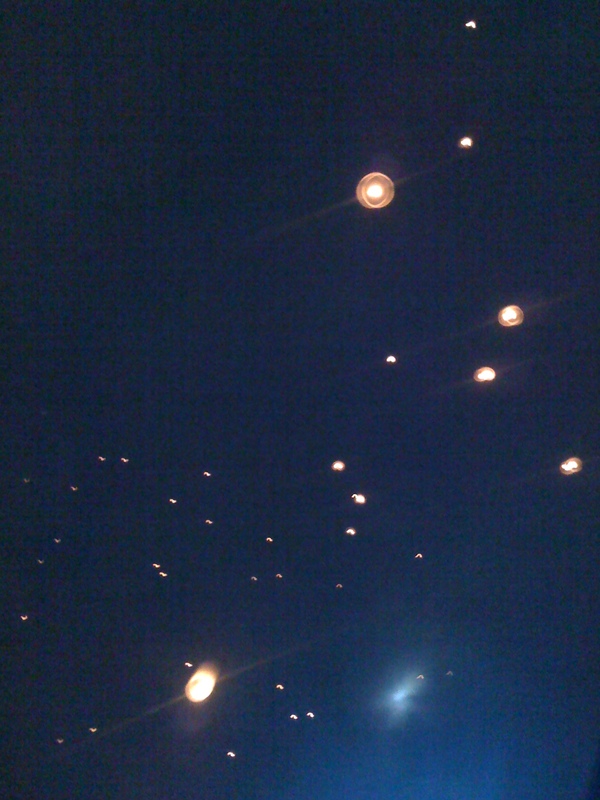 Also they write their wishes and good luck onto a lantern, light it, and send it high into the night sky. Other people spice it up with huge parties and firecrackers abound wherever you walk! A magical sight to experience and to be a part of. There are literally hundreds of well-preserved temples – our favourite was Wat Bupparam, with naga (snake/dragons), buddhas, frescoes and jade. Chiang Mai is close to the mountains and is famous for easy access to the hill tribes, elephant trekking, zip lines and extreme sports experiences. There is an abundancy of agencies providing day trips to tourists. The last stage of the Tour of Hope took us through the mountains where we met the children of the hill tribes, and got up close and personal with elephants, water buffalo, oxen and nature. There are plenty of western-style bars with sports and entertainments, typical of Bangkok – we shall say no more. We had a great night out with fellow riders from the Tour of Hope. 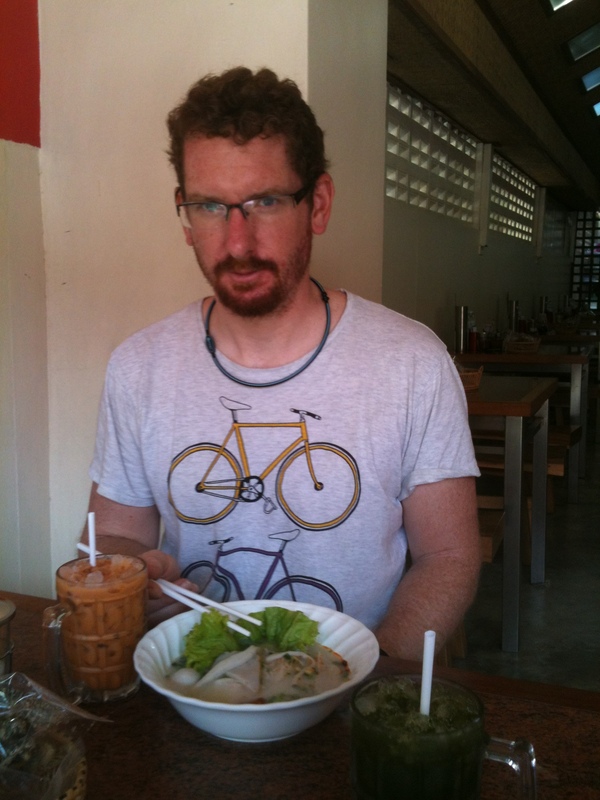 However, because of some of these qualities, Chiang Mai is flooded by tourists and westerners, and is not the authentic experience that we are looking for – so with the bike fully loaded we are off to the next stage. Nous avons terminé l’incroyable expérience du Tour of Hope 2014 : 850 km de Udon Thani à Chiang Mai, cloturés par l’inauguration de la bibliothèque et la donation de vélos aux écoliers. Semaine riche en images et émotions, vidéo en cours de préparation ! Maintenant notre aventure en solo commence !! Les Marchés : les plus gros sont le “Night Bazaar”, le marché du samedi à Wua Lai et le marché du dimanche qui s’étend intra-muros à partir de la porte Tha Pae. On y trouve aussi bien des merveilles de l’artisanat locales que les babioles pour touristes. Aussi l’occasion de picorer quelques spécialités gastronomiques. Une foultitude d’autres marchés fleurisent à travers la ville. 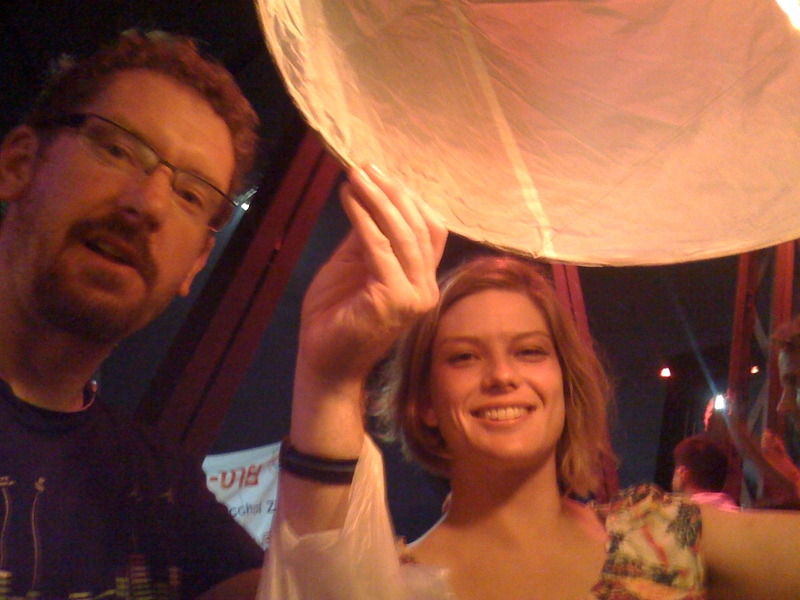 Nous avons eu la chance de participer au festival de Loi Krathong (festival des lanternes). Les mauvaises choses (malchances et mésactions) sont confiées à la rivière Ping à bord de courones de fleurs tandis que les bonnes choses (voeux et prières) sont emportées vers le ciel par des lanternes mongolfières. Magique ! Il y a à Chiang Mai des centaines de temples très bien conservés, celui qui a retenu notre attention de par son originalité est le Wat Bupparam. Situation : Chiang Mai est au pied des montagnes, au point de départ pour des excursions à la découvertes des tribus des colines, des éléphants et de la nature, proposées par les agences de voyage. Nous avons fait ces découvertes lors de la dernière étape du Tour of Hope. 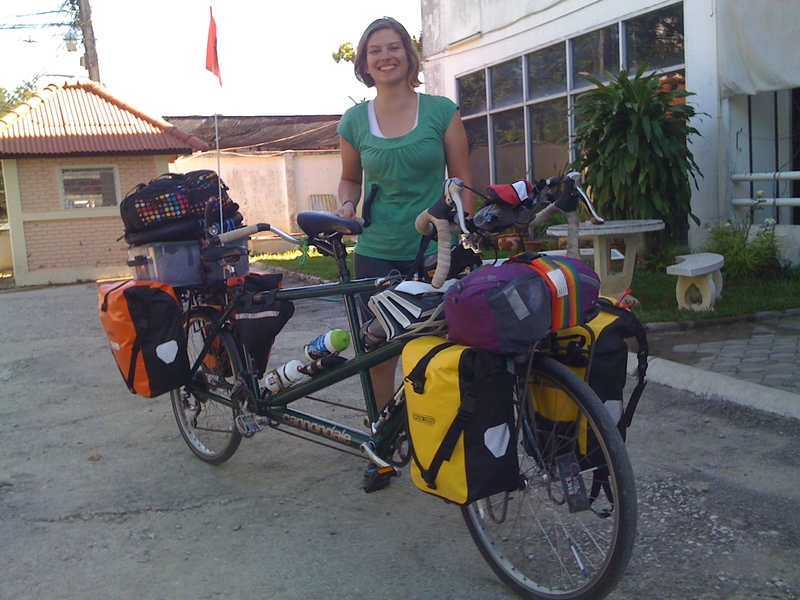 This entry was posted in Uncategorized and tagged Bike, Chang Mai, Cycle Touring, Loi Krathong, Tandem, Thailand. Bookmark the permalink. Wow, that was some very challenging biking! Best of luck on the next stage of your adventure! Thanks guys. When are you heading out this way? Keep on trucking Lydie. So proud to have you as a friend. Cheers fella – see you in Hanoi!